Before I knew it the chilly mornings greated me when I woke and summer was speeding to a close. The gorgeous bounty of summer fruits would soon be disappearing so I’d have to act quickly. 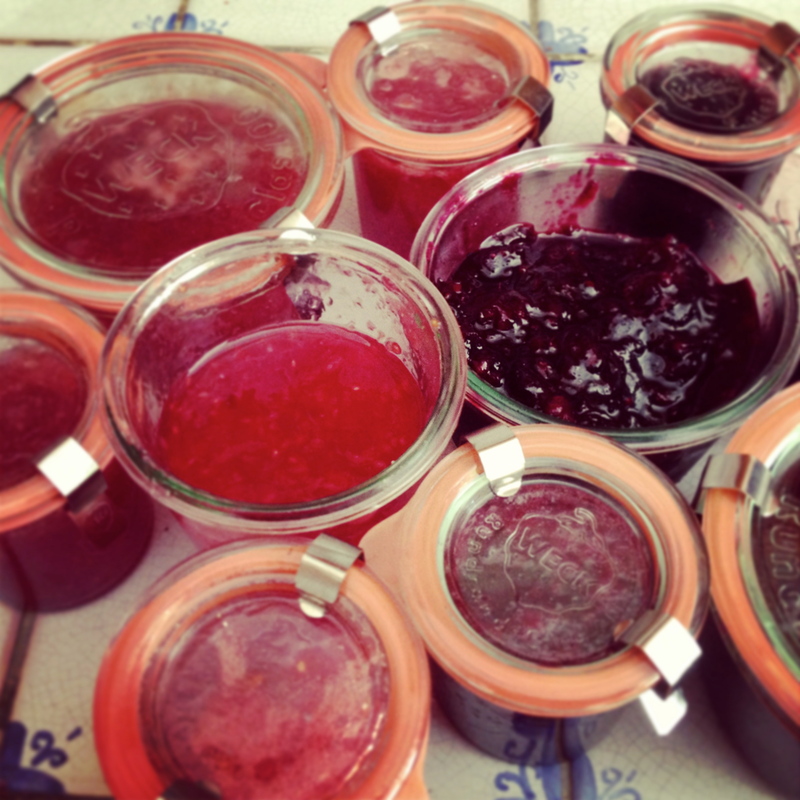 This is a tale of two jams, and you’ll see why. Both in my opinion are delicious, however one decided it would rather be less structured. I know can guess where I went wrong with this; It could have been roasting the plums to easily remove the skins. Doing this ruined the natural pectin in the plums. 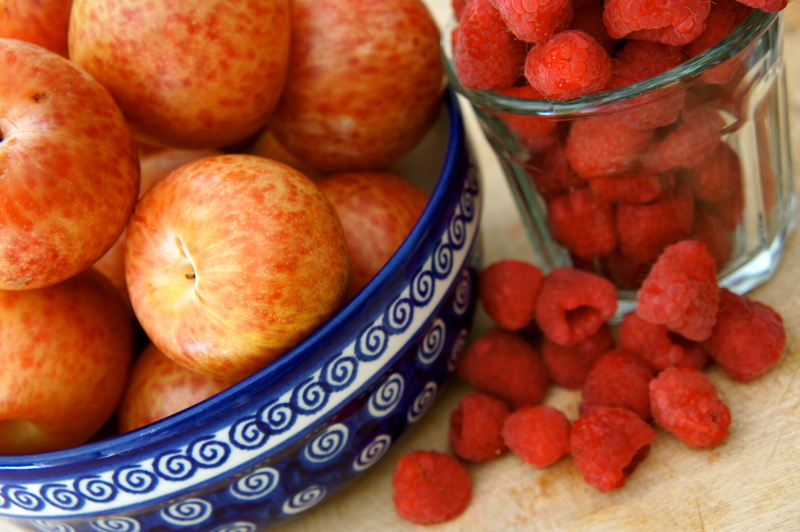 Or, over boiling after adding the rapberries, or using liquid pectin. Or stirring after adding the pectin. Or was it panicking that the jam was too runny and frantically adding more plum pieces? Probably all of the above. On the bright side a very tasty thick juciy flavoursome sauce was made, it did firm up in the fridge. I’ll be using this as a sauce for steamed sponge plum pudding and drizzling it over waffles. Preheat the oven to 350 degrees, half the pluots and place skin side down in an ovenproof dish. Bake until they are soft and the juices begin to ooze. I went through this rather elaborate roasting to remove the skins, So carefully pull off the skins and pop the plutos into a sauce pan. To that add the raspberries, sugar, juice of a lemon and then throw in the lemon too. At this point, stir until the sugar is dissolved and bring to a rapid furious boil. As its boiling I add in the liquid pectin. I’ve never used liquid pectin before and put the entire sachet it, I’m not sure if this was correct or not, but that’s what I did. I then stirred some more. Jam making mistake! Don’t stir after the sugar has dissovled and the boil is rolling. Not wanting to be wasteful I poured it into jars and processed them. A day of reflection can work wonders. The jars are steralised and still warm in the dishwaser. The little bowls to test the jam in are chilling in my freezer. The fruit is glistening from just being washed, and the sugar and pectin precisely measured. I very roughly chopped the blackberries after I put them in the pan, what can I say? I sometimes get carried away and miss a step. Into that, I added the juice of 3 limes, the pectin (powdered this time) and the sugar. Turned the heat on to medium and stirred until the sugar had dissolved. Allow the frantic bubbling to go on for five minutes and then take a dish from the freezer and spoon a little of the syrup into it. Run your finger through it and if the syrup stays parted its time to get the jars. If not, I like to repeat the test every minute or two. Hot jars, hot sugar syrup, be careful. Ladle the jam into the jars almost to the top. Seal them. My jar of choice is Weck, I’m completely and utterly obsessed with this brand. The clean lines, the rubber seal, the glass lids and little clips. Anyway, when the jam is jarred, submerge it in a water bath, the water should be about 1 inch over the jars. Bring to a boil and boil for five minutes, remove the jars from the water and leave to stand for ten more minutes.